Sai Manoj Gali, worked as a researcher and rocket engineer in the Indian Space Research Organization (ISRO): Satish Dhawan Space Centre, Sriharikota- India, during the period 2007-2012. He received a Master degree (M.Sc) in 2014 by joining the European Erasmus Mundus Master in Functional Advanced Materials Engineering (FAME) between the University of Augsburg (Germany) and the University of Bordeaux (France). He earned a PhD in Chemical Physics from the University of Bordeaux (France) in 2017, working in the group of organic electronics, under the supervision of Dr. Luca Muccioli and Dr. Frederic Castet. His PhD was focused on exploring the relation between the molecular structure, energetic fluctuations and micro-mechanical strains on the charge transport properties of organic electronic materials, through atomistic modeling. 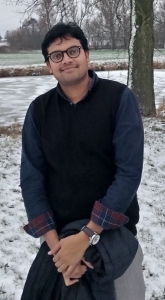 Since November 2017, he is a Postdoctoral research fellow at the University of Mons- Laboratory for Chemistry of Novel Materials (CMN). His main research interests include, theoretical studies on (i) Charge transport in 2D materials as a function of structural defects/imperfections (employing quantum-chemical calculations), and (ii) Atomistic interaction of functionalized molecules with graphene and graphene oxides, employing Molecular Dynamics simulations.